Lo, for many years I have sought a thing that cannot be found. I have sought a place of order in a world gone mad. A small portion of my home that I could carry on my back. A traveling companion I could keep with me day in, and day out. A home away from home for my cameras. A solution to these desires that did not make me look like a dork. Well, any more of a dork than I already am. 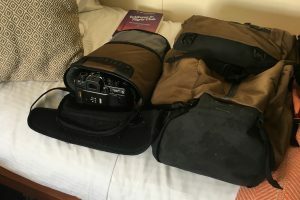 I sought the Holy Grail- a workable camera backpack. And lo, I have wandered far and wide, hither and yon, to and fro in this quest and at long last, I have found the thing. My quest is at an end. This is the Boundary Prima System. Boundary began life as a Kickstarter, I missed out on this portion of their history as I was wandering lost in the darkness, or I may have jumped earlier. Once I got the system, I was dumbfounded. I kept putting off this review, waiting to find a deal breaker somewhere in the system. I kept looking, and looking, and looking. I found a couple flaws, which I’ll touch on later, but nothing major. The Prima system is made up of three elements- The Prima Backpack, the Verge Case, and the Fieldspace organizer. I’ll take those in reverse order. 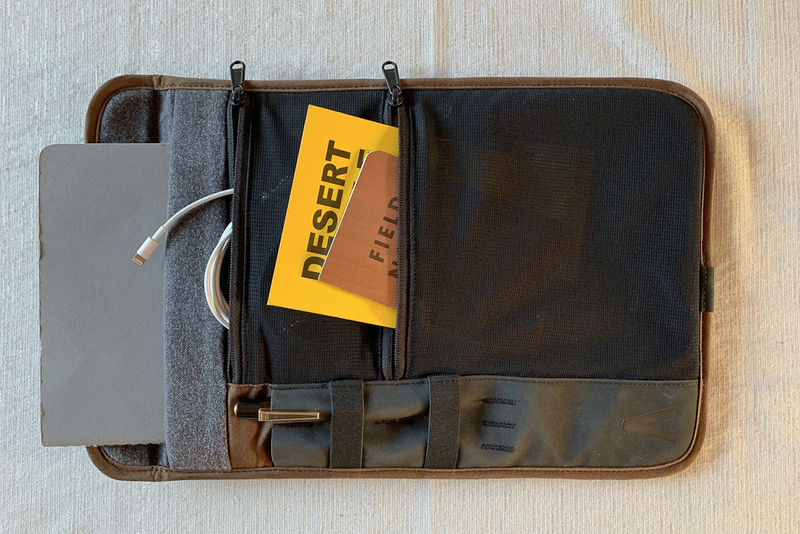 The Fieldspace organizer fits in the back of the pack, adjacent to the laptop space. I use the Fieldspace to keep track of all the things that would usually come adrift in a backpack. Things like fountain pens, USB thumb drives, pencils, and the myriad cables that are required to recharge the essentials of modern life. It’s also a capital place to keep my Moleskines. I’ve fallen in love with the XL size Cahier these days, and a couple fit perfectly in the back of the Fieldspace, under the magnetic flap. If I still had a tablet, this would be a perfect place for it to live as well. Honestly, I started using the system thinking the Fieldspace would just get yanked out of the pack and set aside and never used. It worked out the complete opposite. I use this organizer every day, pulling out well located things and putting them back, and then the whole organizer goes back in to the pack with a satisfying click. The Verge camera case can be snapped in to the backpack, or used separately. I carry two cameras in it on a regular basis, one a large autowinding film SLR and the other a small mirrorless. The case flap has a zippered pouch on the outside that fits an older iPhone or a spare battery. Mesh pockets under the flap can hold SD cards or film canisters. The bottom of the case can be zipped open, which extends it to accommodate zoom lenses. 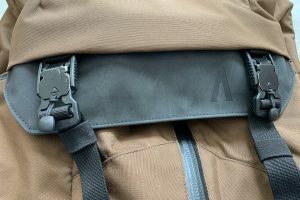 The strap doubles as a waist belt for the pack, but I’ve never used mine for that purpose. It can also be worn as a hip pack with that same strap if desired. The backpack itself is spot on. The shoulder straps are just wide enough, and have a healthy amount of well ventilated padding, and the sternum strap is adjustable enough even for my freakishly long torso. It is secured with one of the companies’ signature magnetic straps. 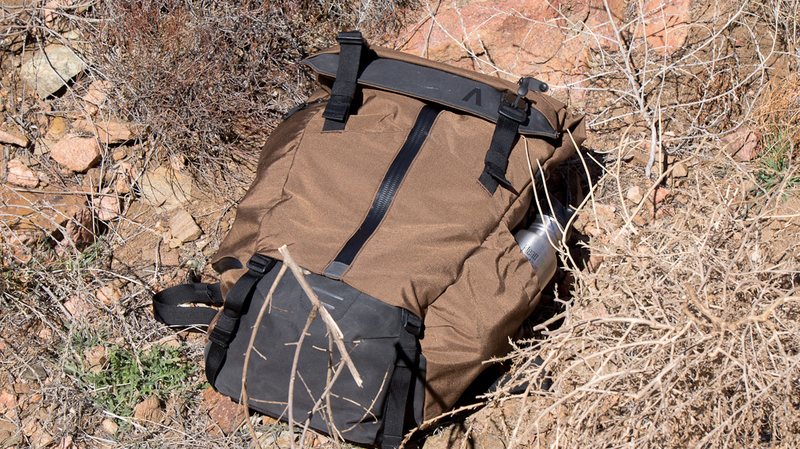 The back has the same padding on it and offers excellent air flow, as well as being stiffened to keep the shape of the pack. 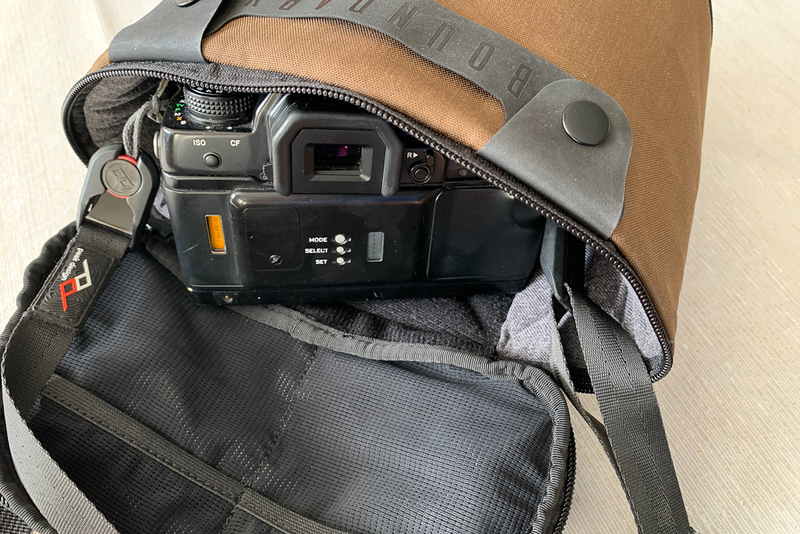 The Versa case snaps inside the pack for airport carry on situations, but it can also be mounted on the outside of the pack to free up space inside and make your cameras more available. 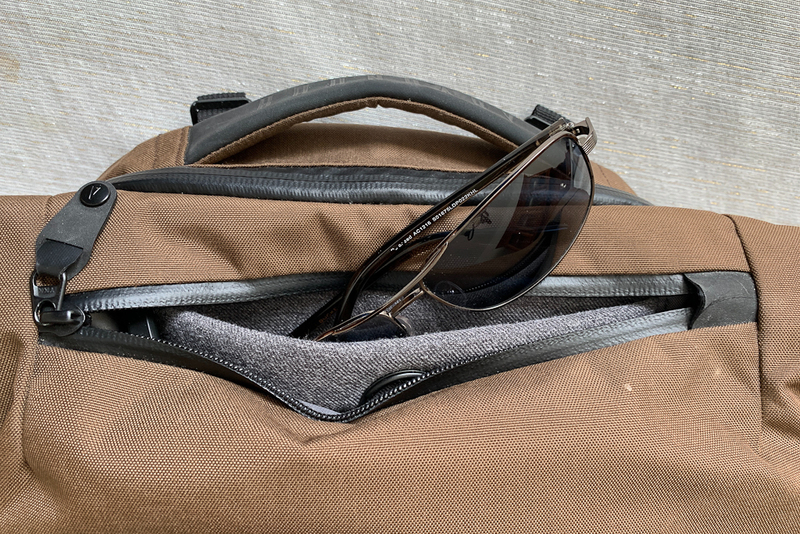 A top pocket, located on the weather flap, not only is ideal for things you need while in route or during the commute, it has a pocket designed for glasses, lined with Nywool to prevent scratching. This is an excellent addition, as I am forever just sticking my sunglasses in the first place I can find and then forgetting where I put them. It also contains a magnetic key ring, which snaps your keys securely in place inside the pocket. It has internal pockets for smaller items, and a Passport pocket with RFID shielding, if you have concerns about that. It does keep the passport handy for clearing customs. 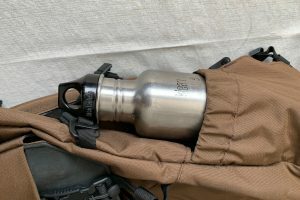 The external bottle pocket fits my Kleen Kanteens, and can expand to fit the larger Nalgene bottles. The pack also has a pass through for stacking it on rolling luggage. The zippers are all YKK Stormguard and the outside fabric is Hypalon, which is proof against the occasional rain shower and held up well in the spray on a Zodiac. A rain fly is available for longer exposure. The top closes with neat magnetic clasps that I am endlessly amused by. They almost magically click in to place when closing them. All the fabrics in the pack are also Bluesign, which means they are chosen with an eye toward sustainability. The pack is suitable for a weekend trip, or can carry a couple day’s clothes as well as camera gear when checking bags for a longer trip. Paired with a modestly sized duffel, I have done a 10 day trip. However, no one has ever accused me of being a clothes horse, so your mileage may vary. I also carry it as my EDC bag, with just my laptops, chargers, toolkit, coffee and snacks for the day. Flaws? Well, some minor ones. I looked long and hard at this bag, as I usually do, and found a few complaints I had read about it did have basis. You can’t sit this back straight down on the bottom and expect it to stay upright. This is true, but historically, I’ve rarely had a pack that would do that. My back country backpack, an Osprey Atmos AG 50, never sits on it’s bottom. I developed the habit of always propping it at an angle when I put it down, and that habit carried over this this bag so well I didn’t initially notice it was the case. Some have complained that the fabric gets marked up by scuffs and the latches lose paint. It’s true that over the time I’ve used it the bag doesn’t look brand new anymore, but neither does it look shabby. If it was a camera, I’d call this “brassing” and it’s to be expected on any well used piece of gear so it never really phased me either. It is a bit heavier than most bags of this size, which I largely attribute to the reinforced back, but it is still comfortable to wear. A couple extra pounds I will tolerate, discomfort I will not. In short, the Prima system is as perfect as I am ever likely to find. I would have liked more color schemes to chose from, which led me to buy the first brown backpack I have ever owned. The other colors come with a green interior I didn’t like. But really, that is picking nits, and the brown has grown on me to the point I wouldn’t take another color now. This is the longest review I have ever written. It’s fitting, though, as this is the longest quest I have ever undertaken. I took this bag on long hikes, through half a dozen airports, two countries, and back and forth to work for months testing it. I kept waiting for it to fail on me but it never did. At long last, the grail is found. I need never quest again, and I hope it holds up for me to enter old age with it strapped securely to my back. The Prima system was rated the best camera/travel bag of 2018 by several organizations. I like to think of it as my forever pack.